The following is from an article on the documentary that aired in May on BBC Four. Nat King Cole, the first black American TV star and a friend of President John Kennedy, conquered hearts and minds across the world with a string of hits in the 40s and 50s. But behind the singer’s ever-present smile lay sadness at a racist campaign of terror that he and his family suffered at the hands of his wealthy white neighbors on Hollywood’s doorstep. The full extent of the hostility endured by the musician in the exclusive Los Angeles neighbourhood of Hancock Park has now been revealed in a new documentary. The jazz pianist and singer had already achieved star status with his King Cole Trio when he decided to move in 1948 to the well-to-do suburb, which boasts Howard Hughes, Katharine Hepburn and Mae West among its former residents. But Cole and his family were breaking new ground as the first black people to live there. Their arrival sparked a storm of protest, beginning with a legal battle by the Hancock Park Property Owners Association to try to prevent him from buying the house. When that did not work, the association tried to buy the house from the star. And months of abuse followed, in which his dog was poisoned and racial insults burnt into his lawn. 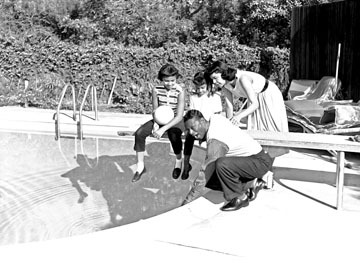 AT HOME Nat King Cole with wife Maria and daughters Carole, left, and Natalie. Natalie Cole, daughter to Nat King Cole, says discrimination is still evident in the US; it is just more subtle. 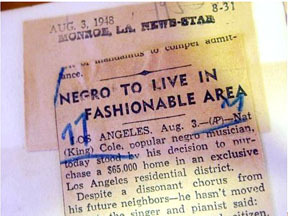 Fortunately for the Cole family, in the same year that they moved to Hancock Park, a US Supreme Court ruling banned racially restrictive property covenants. The document was discovered during the making of a new documentary about the star, which was broadcast on BBC Four. It features the singer’s family and friends talking about the racism endured by the star. “It was not an easy time for him or his family; nobody wanted him,” recalls his friend Harry Belafonte. Cole’s neighbors “didn’t want black people in the neighborhood and they did everything to make him uncomfortable,” says the music publisher Ivan Mogull.